Al-Aqsa Foundation for Endowment and Heritage said that the occupation authorities have continued the excavations and destruction around the Mughrabi Gate. The foundation concerned with monitoring the Israeli violations against the Islamic sanctities noted in a press statement on Thursday that the ‘Sharansky Proposal’ and the Israeli government plans in Al-Buraq area "represent part of a comprehensive plan to Judaize the whole area, which includes Al-Mughrabi Gate and Al-Buraq Wall. “Both places form an integral part of the Islamic heritage in the area ... they were forcefully seized by the Israeli occupation authority, which has been destroying and judaizing them. 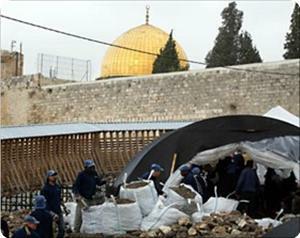 However, their Islamic identity cannot be changed with time.” Al-Aqsa Foundation said. It said that it has recently monitored acceleration in the excavations and destruction around the Mughrabi Gate, and charged that the occupation has been creating empty spaces underground for building synagogues that will be linked to the rest of the Buraq Square. The Foundation called for unifying the Islamic and Arab efforts to confront the IOA and stop its dangerous attacks on Al-Aqsa Mosque and the city of Jerusalem. For his part, Dr. Ismail Radwan, Minister of Endowments and Religious Affairs in Gaza, warned that Al-Aqsa Mosque had entered a very critical stage, in light of the escalating Israeli Judaization schemes. Dr. Radwan said in a statement on Thursday that the IOA has continued the construction works in the project of "Beit Strauss" in Al-Buraq Square, western Al-Aqsa Mosque, after it had demolished facades of ancient buildings belonging to the Islamic endowments, nearly a month ago. He pointed out that the excavations aim to implement big Judaization schemes and to drastically change the Buraq Square. The Minister demanded the Arab and Islamic nations, the Arab League, the Organization of Islamic Cooperation, the Islamic organizations and the nation's scholars to take serious action to stop the Israeli practices against the Islamic holy sites. Israeli occupation forces (IOF) bulldozed Palestinian fertile farmland between two villages in Jenin province to pave the way for construction of a new street. Local sources said that IOF soldiers were deployed in the land between Fakua and Arbuna villages and guarded the bulldozers. They pointed out that the new street, which is near to the racist, separation wall, would serve Jewish settlers in the area. They said that IOF soldiers had recently distributed notifications for the confiscation of 150 dunums in that same area. 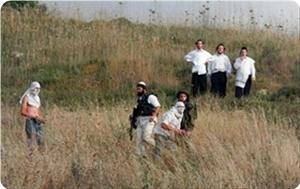 A group of Jewish settlers seized by force Palestinian agricultural land in Tel Armidah area in the city of al-Khalil south of the West Bank. 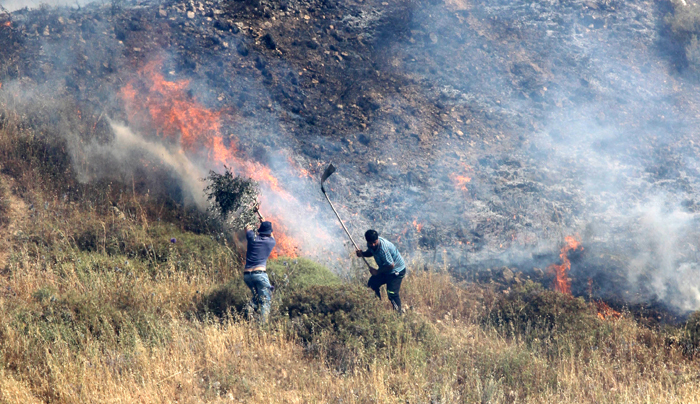 The settlers seized an agricultural land owned by Abu Haikel family and began to farm it after linking it to a water network in a neighboring settlement, the Rehabilitation Committee in al-Khalil said on Tuesday. Abu Haikel family pointed out that their land, about five dunums, has been subjected to several previous settlers' attacks during the past ten years. The family called on local and international human rights organizations to back Tel Armidah's residents who are constantly exposed to the Jewish settlers' attacks that aim to deport them and confiscate their lands. In the same context, Israeli bulldozers demolished on Tuesday water wells in Khirbet Alderat, east of the town of Yatta southern al-Khalil, under the pretext of being established without permit, the coordinator of Committee Against Settlement revealed. The committee's coordinator added that the Israeli occupation forces had served demolition notices to more than 60 facilities in the region. Israeli occupation forces (IOF) advanced into eastern Khan Younis, south of the Gaza Strip, on Wednesday morning escorting huge military bulldozers. Local sources told the PIC reporter that the bulldozers leveled land in the same area they raided on Tuesday during which one of them was targeted by Palestinian resistance. 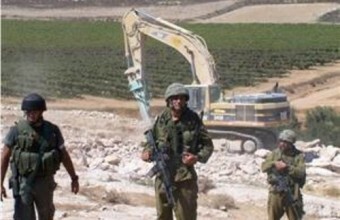 The IOF troops and their bulldozers evacuated the area to the east of Khuza’a town east of Khan Younis at noon Tuesday. 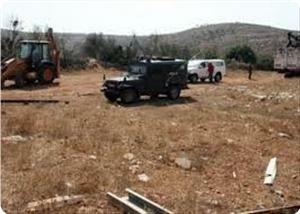 Israeli army Tuesday demolished a well and a farm house east of Yatta, south of Hebron, said local sources. Ratib al-Jabour, coordinator of the Popular Committee against the Wall and Settlements in Yatta, said the soldiers raided the village and demolished the well and the farm house then handed a demolishing notice to another Palestinian. Al-Jabour condemned these actions describing it as “arbitrary” which aim to displace the people of these areas for settlements expansion. The Israeli military authorities informed eight families of Ein el-Hilweh living in the northern Jordan Valley that they have until the end of the month to evacuate their shacks and move somewhere else, Palestinian official news agency WAFA reported. 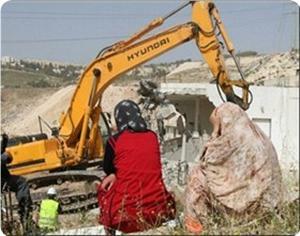 Aref Daraghme, head of al-Maleh local council, said the shacks and tents were on that land for tens of years. 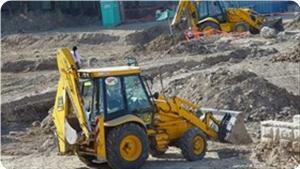 He warned that Israel intends to seize the land after forcing its Bedouin residents to leave it. Israeli occupation forces (IOF) chopped down around 350 almond and olive trees near Daheriya town, south of Al-Khalil, on Tuesday morning. Director of public relations in Daheriya municipality Mohammed Raba said that the soldiers chopped down 100 olive trees and 250 almond trees in Midemana area in Daheriya. He said that the soldiers after destroying the trees, owned by two brothers in the village, sprayed poisonous chemicals on them. He said that the two brothers were not notified beforehand of the act. Palestinian resistance elements blasted an explosive device in an Israeli army bulldozer south of the Gaza Strip on Tuesday. Eyewitnesses said that the explosion to the east of Abbasan Al-Kabira town, east of Khan Younis city, targeted a bulldozer that was leveling Palestinian land. 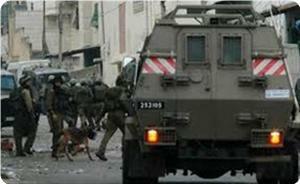 They said that a number of Israeli armored vehicles rushed to the scene after the explosion. 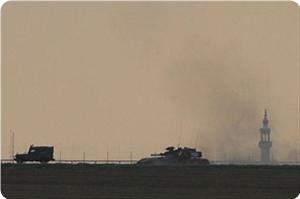 Israeli occupation forces had escorted eight bulldozers that infiltrated 200 meters into southern Gaza earlier on Tuesday. Sources from the Gaza Strip revealed that a bomb exploded in an Israeli vehicle while raiding east of Khan Younis, south of the Gaza Strip. Israeli forces infiltrated Gaza borders and went nearly 300 meters into the eastern part of Khan Younis, according to witnesses. They told Palestinian official news agency WAFA that four Israeli tanks and three army bulldozers raided and razed agricultural land while shooting in all directions. 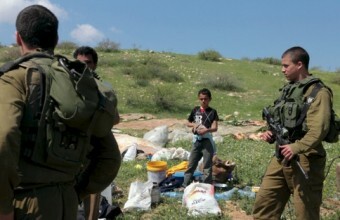 Witnesses said Israeli forces regularly raid and raze land in that area and prevent residents from reaching their land. Israeli bulldozers ruined vast tracts of Palestinian land owned by inhabitants of Deir Al-Hattab village, east of Nablus city, on Sunday. 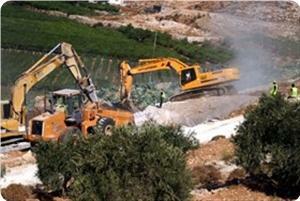 Abdulkarim Hussein, the head of the village’s municipal council, said that the Israeli bulldozers have been working on the destruction of olive and almond trees over dozens of dunums for the past couple of days. He said that the Israeli occupation authorities want to expand the nearby Elon Moreh settlement, which was established on land owned by people of Deir Al-Hattab, Azmut, and Salem villages, or maybe establish a new settlement outpost. Hussein appealed for international pressures on the IOA to stop such practices. The territory was categorized as abandoned, meaning the Civil Administration was given responsibility for the land until the owners returned. The Tel Aviv District Court ordered 100 dunams of land within the settlement of Alfei Menashe returned to their Palestinian owners after ruling that the contracts purportedly documenting the sale of the land were forged, reported Haaretz. The key ruling further invalidates a series of transactions made following the fraudulent sale. The land in question originally belonged to Palestinians who fled to Jordan when the Israel Defense Forces entered the West Bank in 1967. The territory was categorized as abandoned, meaning the Civil Administration was given responsibility for the land until the owners returned. Fraud involving abandoned land is common, since the owners have difficulty tracking their property from abroad. In 2001, a company named G.R.A. ostensibly bought land from a Palestinian from Qalqilyah for $150,000. Then, in 2006, the deed to the land was transferred from G.R.A. to another company, Harei Bracha, which specialized in construction for the Haredi sector. That year, the heirs of the land's original owners found out that it had been sold, and petitioned the Tel Aviv District Court, alleging fraud. Israeli occupation forces (IOF) stormed Al-Khalil city and nearby villages and broke into houses and shops on Sunday morning. Eyewitnesses told the PIC that IOF soldiers in five patrols burst into three suburbs in the city and forced their way into houses and shops and searched them. 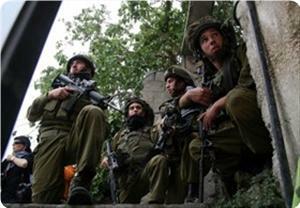 They said that other IOF soldiers stormed the nearby villages of Beit Ummar and Halhul for the same purpose. The witnesses said that the soldiers confiscated computers from homes and shops stormed in Namera suburb in Al-Khalil city. Israeli soldiers Saturday assaulted farmers and shepherds in an area south of Hebron, according to local sources. They told WAFA that Israeli soldiers raided the area and brutally assaulted farmers and shepherds and forced them out the land after clashes between them and the farmers. Members of Al-Nawaj’a family, who live in the area, said Israeli soldiers attempted to arrest several farmers and the head of the village council of Susya, Jihad Al-Nawaj’a, but peace activists interfered and prevented them from doing so. Farmers told WAFA that the Israeli soldiers raided the area and forced the farmers off the land, claiming that the land was “state land,” even though the Israeli court issued a ruling in 2006 stating that farmers are the rightful owners of the land. Israeli military handed a Palestinian from Hebron a notice to demolish two water wells and uproot trees in his land, said local sources. 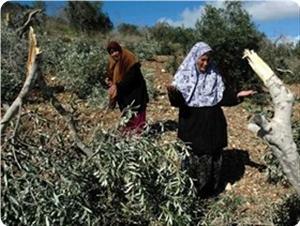 Ratib al-Jabour, coordinator of the Popular Committee against the Wall and Settlements in Yatta, told Palestinian official news agency WAFA that members of the civil administration, the Israeli military's arm in the West Bank, raided the area south of Hebron and handed the land owner a notice to demolish his wells and uproot his trees. The Israeli authorities informed a Palestinian farmer from the village of Nahalin, west of Bethlehem, of its intention to take over his private-owned land for the benefit of settlement expansion, according to a local activist. Head of the village's council Jamal Najajreh told Palestinian official news agency WAFA that Ali Fnoon found notices on his three dunums of land, located just off of the settlement of Daniel, built illegally on villager's land, ordering him to evacuate it in order to seize it. 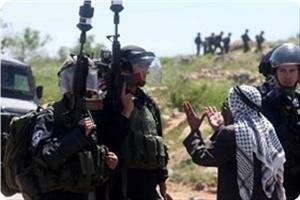 The notices, he said, gave the farmer 45 days to file a petition against the order at Israeli courts. 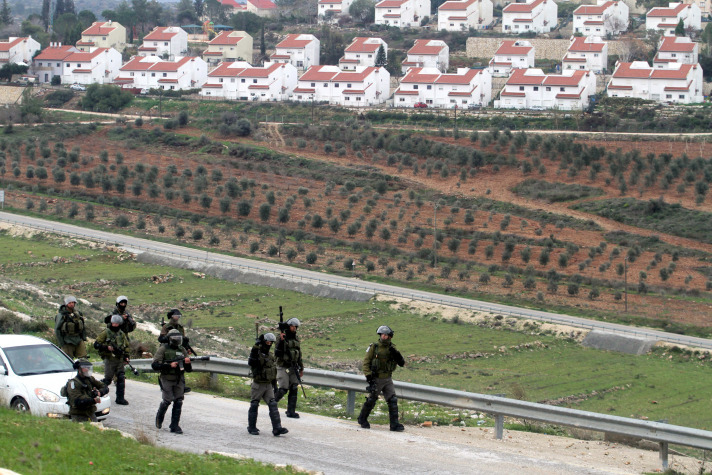 Israeli occupation has confiscated thousands of dunums of Palestinian lands in Deir Jarir, Silwad and Ein Yabrud for the construction and expansion of Ofra settlement, east of Ramallah. Haj Abu Mahmoud Silwadi, 90, says that the occupation has confiscated in 1978 his land which has an area of more than 20 dunums, and confirmed that he has papers that go back to the Ottoman era proving his ownership to the land, . He added that the occupation had told him that his land would be confiscated for the benefit of the army of occupation, but in the eighties the army started building housing units for settlers. According to the Israeli law, the army is allowed to confiscate Palestinian lands for military uses, but it is not allowed to use confiscated land for building settlements. One of the officials in Silwad Municipality says that they have filed a lawsuit in the occupation courts, years ago, against the construction of the settlement and the prevention of farmers from entering their agricultural lands located in the center of the settlement. The occupation court issued a resolution obliging the army to remove the wall around the settlement and to demolish the buildings set up on Palestinian lands. However, the Israelis submitted an appeal to the court to postpone the implementation of the resolution. For his part, Salim Abu Makhou, one of the residents of Deir Jarir village and the owner of a land adjacent to Ofra settlement, pointed to the continuation of the settlers' attacks on Palestinian lands, the last of which was uprooting olive trees in the eastern side of the settlement. 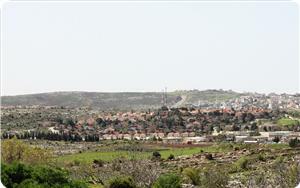 The citizen Mohammed Dahabra, from the village of Ein Yabrud in the western side of the settlement, told PIC's correspondent that the settlers have been constantly trying to buy lands belonging to the citizens who live in America, and urged for launching a campaign to raise public awareness about these schemes. Silwad Municipality said that according to Israeli law, 55% of the lands located inside Ofra must be returned to Palestinians, and confirmed that it will continue its efforts to return the confiscated lands. 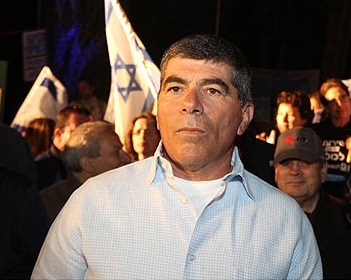 Israeli Deputy Prime Minister Haim Ramon has admitted in an interview with Haaretz that Ofra contains 450 illegal houses, according to occupation law. [According to international law all settlements are illegal]. Khalil Tafakji, director of Mapping and Geographic Information Systems Department of Arab Studies Society in Jerusalem, said that Israel is continuing policy of ethnic cleansing in Jerusalem as it did in Galilee and Negev in 1948. He told PIC that the policy which has been adopted by Israel against Jerusalem on the 37th anniversary of Land Day represents an extension to the policy of Judaization of the Galilee and Negev that has started since 1948. Tafakji pointed out that the occupation has continued and stepped up its policy of Judaization in the occupied city of Jerusalem, as it aims to make it its central capital. He stated that the successive Israeli governments have been spending huge amounts of money to achieve this aim, in addition to the policy of ethnic cleansing, evicting and displacing the residents and replacing the Palestinian population and the legitimate owners of the land in Jerusalem by settlers. Tafakji has also condemned the absence of an Arab and Palestinian strategy regarding the issue of Jerusalem. The Israeli occupation authority (IOA) on Monday evening forced a Palestinian citizen to demolish a room of his house in Sawwanah district east of occupied Jerusalem at the pretext of unlicensed construction. Tayseer Abul Hawa, owner of the house, said that in 2005, he had built an additional room in his house, but the Israeli municipal council demanded him to knock it down or get a construction permit, adding that he tried hard during the past years to have the room licensed, but to no avail. He pointed that an Israeli municipal court, in 2010, ordered to imprison his wife if he did not remove the room, adding that his lawyer managed to delay the demolition of the rooms several time. The owner also said that he has paid the IOA construction fines of about 11, 000 dollars so far. Al-Fahidat district, part of the Palestinian village Anata, in the Jerusalem Governorate, is under threat of demolition. The Israeli Army intends to build a military base there. 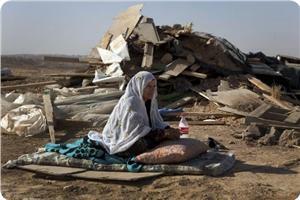 More than 200 Palestinians will become homeless as soon as the district is destroyed. The local residents' attempts to fight the officials' decision have gone nowhere. "They continue to send us papers to make us sell our land. But we do not need money, we need our land which we managed to save after they took away the major part of the land. We stay here despite the hardships and we will try to save our lands no matter how much time it will take", says sheikh Sari Fhidat. The locals hold demonstrations and have addressed the Israeli court in the hope of preventing the demolition of their district. They are determined to stand their ground. "We consider these notifications to be just words, which cannot make us leave our homes. Our ancestors were born and lived here. Our fate is predetermined. We will either be buried here or sent to prison. We won't leave our lands", says local resident Zayad Fhidat.